This is a regular blog post. Please check our the other posts if you’re looking for show notes or links to show audio. The airshow season continues in spectacular form! I rolled out of bed (off of couch) this morning at 0930Z, ran through the shower, and headed out to Ray Community Airport (57D) in Macomb County. A very nearly perfect morning, cold and clear. And a beautiful airport to boot. An airport made even more beautiful shortly after 1200Z by the red-and-checkerboard flashes of the A36 Bonanza and the ethanol-powered MX-2 of the Fagan-sponsored Greg Poe Airshows team. 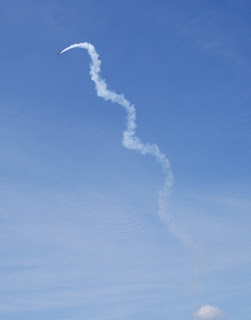 I was on site this morning in connection of the Selfridge Airshow and Open House, which kicks off this Saturday and runs through Sunday. The base puts on a great airshow every other year and this is a show year. In addition to converting a lot of 100LL, and JP-8 (and ethanol this year! ), the Selfridge show is an opportunity for the base to let the broad community around it inside the gates and show the folks what the armed forces stationed there do. 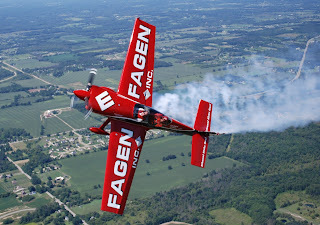 Greg Poe is performing at the show and he and his team were kind enough to fly media rides. It was a primo opportunity. 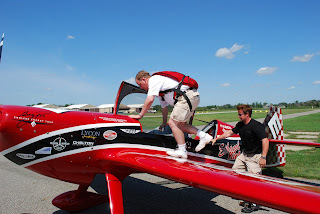 Greg’s team brings both the MX-2 show aircraft and an A36 Bonanza. The doors come off the Bonanza shortly after arrival and the photographers and videographers climb in, harness up, and shoot their respective riders getting a snootfull of precision aerobatics. The MX-2 is amazing. Shortly after I started tweeting about it, a couple of followers tweeted back about the aircraft, and rightly so. It’s an all-carbon airframe built to withstand +16G/-16G. A Lycoming IO-540 modified by Lycon Performance Engines hangs in the front, putting out 385 hp to pull the 1,350-pound airframe. It’ll roll 420 degrees/sec and has a Vne of 275 mph. And Greg is no wallflower either. He learned to fly in taildraggers in the Idaho back country at a young age and then became an instructor, primarily in tailwheel aircraft and specializing in aerobatics. 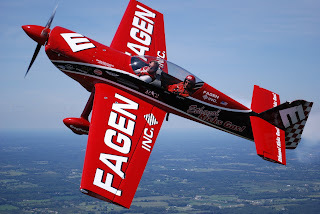 He started performing in airshows in 1992 and was performing full time after that, hitting 15 to 25 airshows and events each year. And, talk about dream jobs, he was the production test pilot for Aviat Aircraft in Wyoming, test flying each Pitts and Husky as it came off the line. He has time in the MiG-15, the B-17, and the F-15, F-16, and F-18 fighters. He’s also one of the very few civilians ever to ride with the USAF Thunderbirds during a full demo. He rode with Thunderbird 4 in an F-16D in the slot position. He’s sponsored by Fagen, Inc., a green energy designer and builder in Granite Falls, Minnesota specializing in ethanol and wind power. 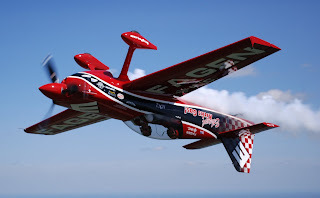 The MX-2’s engine is modified to burn ethanol and it’s the only aerobatic aircraft on the airshow circuit that burns ethanol in its performances. We showed at 8:00 and stepped around 1:00. Selfridge had a great turnout of media for the flights and I went up on the fifth ride. Really nice to see a good media turnout for this event so Selfridge gets good press. It’s also spectacular that Greg did the rides on a Wednesday, allowing lots of time for the deadline-driven media to get material in print or on the air well prior to the show to maximize the buzz. I was lucky enough to have two CAP squadron mates along to shoot stills and video. In their non-CAP capacities, of course, but it’s still all about being a part of the aviation tribe. Jason Schroeder shot the stills and Mike Murphy shot video for my ride and also took stills from the front seat of the Bonanza for the Free Press rider. This post features Jason’s images and the video episode will feature Mike’s video. We took off in trail (Ray is 2,500 x 60, so a formation launch wasn’t really an option) and formed up to the north of the airport. A really good set of air-to-air passes, including knife-edge, inverted, rolls, and a high-speed pass directly below the Bonanza. Then the loop and some vertical rolls to a reversal. The vertical rolls were spectacular. It’s the most hang time I’ve ever experienced in an aircraft. I know that the airplane probably didn’t truly helicopter in the vertical with my 210 pounds in the front seat, even with minimum fuel. But it sure felt like it. I didn’t have the presence of mind to look over at the horizon (not that I could have guessed from the horizon when we started to peak), but the sight of the prop up there in front of my nose was awe-inspiring. This massive barn-door-bladed Hartzell prop up there just clawing at the air, refusing to accept a receding VSI for an answer. Every ride (or other flight for that matter) has a moment for me when the noise and the stress and the workload just recedes and I get a moment to just think about one thing. That was my quiet little moment up there. Looking up at the blue sky through the violence of that monster bird shredder and experiencing in the air that phase of flight that I love so much from the ground. The pulls were a lot of fun. The pull at the beginning and end of the loop and the pull to vertical for the vertical rolls in particular. We peaked at +6.5G/-1.6G. (Yeah, they mount a G meter in the front cockpit so you can see it!) I had my AGSM down pat and am proud to say that I had no problem with that dose of Vitamin G. I have pitiful upper-body strength, but monster thigh and calf muscles that are apparently pretty good at resisting the blood that wants to escape from my melon at high G loads. This was my second time on a formation shoot. No flies at all on Billy Werth and his Pitts S-2C, but the visibility was much better in the MX-2. I love acro, but it’s even more fun to do it near, and around, a photo ship. It’s mush more three-dimensional visually and you have a better sense of your speed and maneuverability. Nothing wrong with the sky and ground swapping positions rapidly in the window, but a barrel roll over another airplane is just more of a barrel roll. Does that make sense? Approaching the photo ship from behind, from above, from abeam. Doing it with a 60+ -knot closure rate and watching the photo ship go from gunwale to gunwale in the canopy in seconds. That’s just amazing. And listening to Greg and DO/photo-ship-pilot Dax Wanless coordinate the flight on the radio was cool, too. Counting down to the maneuvers. Exchanging lead responsibilities as effortlessly as I might exchange the controls of a C-172 with Jason. Real professionalism and real safety culture, that. I was pretty happy about the way I handled the inverted flight. I had more the sense of handing from my chest than from the tops of my shoulders and the inverted phase (which sometimes does my stomach in) was to problem at all. The rolls, on the other hand, were really disorienting. That’s good, mind you! This is one of the reasons that I explore the envelope. I had been up in the Super-D four days before flying acro with Barry for the first time since the T-6A ride in May and I lasted a pitiful 20 minutes. Acro tolerance is a genuine use-it-or-lose-it proposition. I did great with the other maneuvers, but the high-roll-rate stuff set off an insurrection in my vestibular system. So Greg called Dax and told him we were coming back in. I took a little bit of ribbing from Mike and Jason about coming back in so quickly after we broke off for the free acro, but that’s okay. Time is the Kryptonite. For acro tolerance, for flight proficiency, and for lots of other stuff. A worthy reminder and worth the figurative elbow in the ribs. Get out to the Selfridge show this weekend! The Selfridge Air Show & Open House will be Saturday-Sunday, Aug. 22-23. The gates will open both days at 8 a.m., with the flying starting both days around 10 a.m. Among the highlights of the show will be a aerial demonstration by the US Air Force Thunderbirds. I’m planning to be there volunteering and I hope to see you there! The 127th Wing at Selfridge is home to two flying missions of the Michigan Air National Guard, serving Air Combat Command and Air Mobility Command. The 127th Wing is also the home unit of the 107th Weather Flight, Air Force Special Operations Command. In all, Selfridge is home to more than 20 tenant units from all branches of the military, the Coast Guard and Border Patrol.